Imagine a city with softened traffic sounds, where noise pollution has been dramatically cut, there are no vehicle exhaust fumes and the sky is a pristine blue. Imagine a countryside where there is little to no road traffic noise, where residents in towns, villages and hamlets will never again be woken from their sleep in the early hours by the highway noise of air brakes as truck and semi-trailer drivers slow their vehicles, creating a sound like snoring dragons. That’s the future of electric vehicles (EVs) in the minds of many researchers, entrepreneurs and carmakers and like a long road trip, signpost by signpost, it is getting closer. There are still many potholes to negotiate on the road to creating a Solar or Smart Highway, but there are signs that the concept of an intelligent transportation system may move significantly closer to reality over the next decade. Such a system would incorporate technology to generate solar energy and lighting, monitoring road conditions and powering autonomous electronic vehicles (EVs). Early in May, Qualcomm Inc, a US tech company at the cutting edge of developing wireless electric vehicle charging technology, announced that its system is expected to be commercially available on EVs within two years. Qualcomm, which has been developing motor vehicle static charging technology with major carmakers for the past seven years, is no small player in the field, with the market value of the company broaching $US92 billion. Qualcomm Halo, the company’s business development and marketing division, said the game-changer was based on the fact that the cost of static wireless charging is now comparable with conductive charging. Being able to charge an electric vehicle wirelessly “makes the ease of vehicle use that much smoother [and] takes away the risk of remembering to plug in to charge your vehicle overnight,” Halo division vice president Graeme Davidson told Bloomberg New Energy Finance (BNEF). “Using an EV with wireless charging will therefore not be that different to using a gasoline car, without the need to visit a petrol refill station,” he said. But it is the likely technological spin-off from this electrical engineering steppingstone that may well be the real game-changer, dynamic wireless charging – an endless supply of power on the move. “Static wireless charging is the first step to developing dynamic wireless charging, where vehicles charge constantly while in motion,” Davison said. During tests in the FabricEV charging program near Paris, Qualcomm technicians demonstrated that it was possible to charge a vehicle travelling at highway speeds with more than 20 kilowatts of electricity from an electrically-inductive road surface. It was the “perfect example for us to show the industry that dynamic wireless charging is possible,” Davidson said. Qualcomm currently focuses on static charging, but in a company statement said wireless EV charging technology lends itself to a future vision of charging on the move. The process of installing wireless charging technology in road surfaces, while expensive, would also allow 5G communications to be installed, which would compliment autonomous driving systems. In a city environment, if EVs don’t have to stop to recharge, they can stay in service longer, meaning far fewer vehicles would be required to meet passenger demand. EVs using dynamic wireless charging could operate with much smaller batteries, reducing production costs, making them lighter and even more attractive to consumers. Wireless charging is being taken seriously by car industry hallmark, US standards organisation the Society of Automotive Engineers (SAE), which has released a draft wireless charging standard (J2954). The progressive development of Standard J2954 will broaden interoperability. Just as standardized home electrical outlets can power any consumer appliance today, standardized wireless charging protocols in the future will make wireless charging an easy way to charge any electric vehicle. Dynamic wireless (or inductive) charging is in the spotlight at motor shows around the world and is being installed by many of the key makers of luxury electric vehicles including VW, Tesla, Mercedes-Benz, BMW, Audi, Porsche and Nissan. Nissan’s corporate Utopian vision is wirelessly-charged autonomous EVs powered by flexible grids, forming the transport framework of interconnected cities powered by clean, green renewable energy. In the meantime, the most immediate step on the road to solar salvation is the low-cost proliferation of EV charging stations along highways and roads to power the EV roll-out, fed by the grid, which in turn is being increasingly fed by renewable energy, including solar power. Based on the premise that necessity is the mother of invention, researchers in the US have come up with a transportable, self-contained, solar-powered EV charging station which can be placed on any road, anywhere. San Diego-based Envision Solar International has designed a grid-free charging station called EV ARC which is towable and can be left at any chosen site, whether it be a city car park or a highway parking bay. The 2.7m x 4.87m EV ARC consists of a ballast pad on which vehicles park to charge and a 21.6KWh storage battery supplied by a 2.3KW solar canopy, enabling it to charge EVs day or night, or during a grid failure. 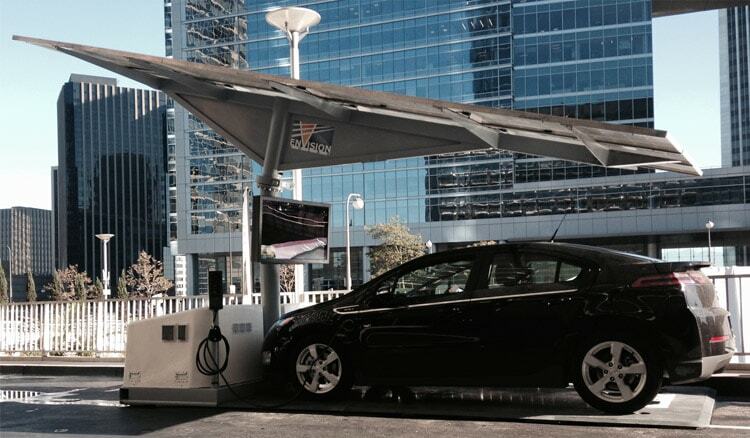 Envision Solar says the EV ARC can charge for up to 362 e kilometres daily. Three EV ARCs are being used in a study conducted by the city of San Francisco to establish the best likely location for EV recharging units. A solar tracking system enables the EV ARC’s solar panels to capture the optimum amount of sunshine from a base area the size of a single car park. But going down the road of mobile, solar-based EV charging is currently not altogether cheap. An EV ARC unit costs about $US45,000 to purchase and generates about 16KWh a day, basically capable of charging a single EV or “topping up” four or five short-run urban electric vehicles. 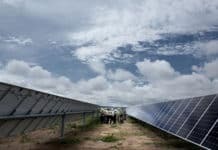 The up-front cost is partly counterbalanced by the US Government’s 30 per cent solar Investment Tax Credit. In mid-May, Envision Solar sold a further five EV ARC units to the California Department of Parks and Recreation, with some units being placed at Natural Bridges State Park in Santa Cruz to be used as public charging for visitors. Market analyst Navigant Research predicts that by 2022 there will be more than 35 million electric vehicles operating worldwide. 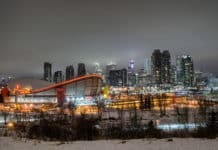 To hold global temperature increases to below 2°C by the end of the century, there will need to be 600 million electric vehicles on the world’s roads by 2040, according to the International Energy Agency’s Energy Technology Perspectives. Meanwhile, researchers continue to strive to find the most effective and cost-efficient way to combine solar technology into highways and roadways. 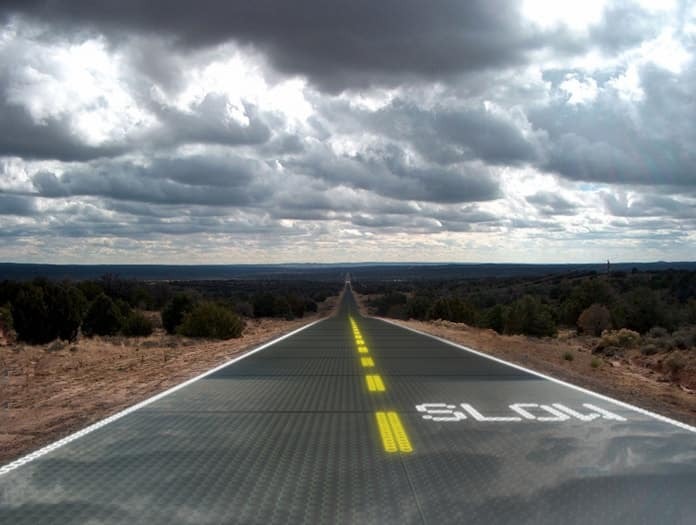 Is a Solar Highway achievable? Not with current PV cell technology and associated high costs of production. 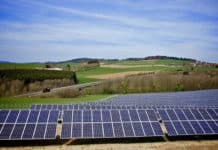 The world’s first solar highway was opened in France in late 2016 in the small village of Tourouvre au Perche in Normandy. Wattway, designed to power the village’s street lights and built by the Anglo-French construction company Colas, is a 1 kilometre-long, single-lane road consisting of 2,800 square metres of photovoltaic cells which cost $US5.9 million. Considering France’s more than 1 million kilometres of roadway, the current cost of converting the nation to this more eco-friendly system is astronomical, around $US5.9 trillion. According to Colas, the Wattway’s main selling point is that the solar panels are only a few millimetres thick and can be installed on existing roadway but it will take two years of testing before it is known how much electricity it can effectively produce as thousands of trucks and cars cross its surface daily. Colas claims Wattway’s photovoltaic efficiency is 15 per cent, compared with about 20 per cent efficiency from commercial, roof-mounted solar panels, but that’s not factoring in mud, snow, standing water after rain and Normandy’s low share of sunlight. In late 2017, China also announced it had built the world’s first photovoltaic highway in Jinan, Shandong province, a 1km stretch of road composed of a three-layered system, a base of insulation, then a layer of photovoltaic panels, topped by transparent concrete. Project designer, Tongji University’s transportation engineering expert Zhang Hongchao, said the expressway, which consists of two lanes and an emergency lane and cost $US458 a square metre to build, could handle 10 times more pressure than normal asphalt and in a year could generate 1 million KWh of electricity. 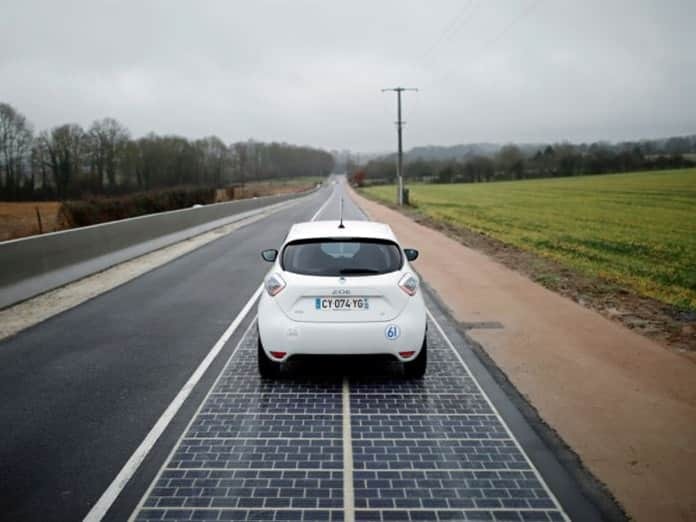 Beyond the current prohibitive costs, there also are engineering and health factors to consider in the construction of a Solar Highway which can both directly absorb solar energy and provide dynamic wireless charging for EVs. According to a 2017 report by the US National Academy of Sciences titled Leading-Edge Engineering: Wireless Charging of Electric Vehicles, although dynamic EV power transfer has yet to be proved economically viable, capacitive wireless power transfer (WPT) has the potential to make widespread dynamic EV charging a reality. “Capacitive WPT systems have potential advantages over the inductive systems because of the relatively directed nature of electric fields, which reduces the need for electromagnetic field shielding,” states the report. The roadblocks on the way to achieving cost-effective, dynamic EV charging are many. They include the effective analysis of the effects on human health from long-term exposure to weak electric and magnetic fields, the need for a system to detect animals and other foreign objects on highways which may interrupt dynamic charging, appropriate engineering techniques to embed dynamic charging into roadways and the need for detailed analysis of how a large-scale dynamic charging system could interplay with the electric grid.